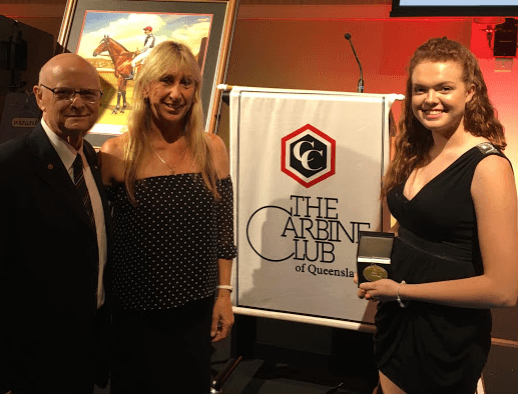 Last year was the first year that the Gold Coast Academy of Sport partnered with the Carbine Club offering a bursary to a deserving and promising junior sportsperson. I was humbled when the gentlemen decided to call the award “The Glynis Nunn”. The Bursary is for $5000 and is set aside to help the athlete prepare for competition and hopefully improve on their performances. The award was selected a panel from the GCAS and is monitored by the Academy. I would like to thank the Carbine club for their support of Junior sport and look forward to our continued association. In 2017 the winner of the Glynis Nunn award is Tianah List. Tianah has been involved in Track and Field for some 10 years but also plays Softball at a very high level. She is coached by Ben Thomson in Brisbane and plans to be around in the sport for a long time. She qualified for the World University Games in Taipei this year but unfortunately due to injury was not selected. Her long term goal is to represent her country at the Olympics in 2020 or 2024 in Javelin. She got her love for the event from her mother who was quite an accomplished thrower when she lived in New Zealand as a young athlete. We congratulate Tianah on her selection for this award and wish her all the best in her future endeavors.